There was a time when I swore I'd never do a marathon. Then I swore I'd never do one again after finding myself sobbing just over 21 miles in to last year's Marathon of the North. Then, after entering the MOTN again in January of this year, I got injured and ill and injured again during my training, so thought it best to withdraw. So I told everyone that I wasn't doing it. But then Boston happened, and then I watched the London Marathon. And I'm a Strider. So I thought 'Hey, I could just START the marathon and see how it goes. What's the worst that could happen?'. And the day before the marathon I found myself quite excited at the prospect, and self-declared driver of my very own running train: the slow train to completion. 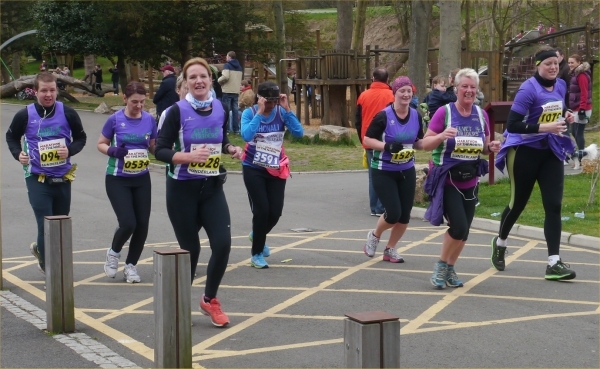 Jill Ford and Katie Butler, running in their first marathon, had already decided that a run-walk strategy was a sensible approach, and we took advice from Emma Detchon who did the 'run a mile, walk a minute' to perfection last year. Settling on this as our race plan, we gained a few extra passengers: Rob Clark, also looking to get his first marathon under his belt, Sue Jennings and Jo Porter, looking to complete their second marathon in just over a week, both having PB'd at London, and Jo Richardson who accompanied Emma on the run-walk strategy the year before and knew it worked and was planning on running round with Jo P. Other Striders sorted themselves into other 'trains' - the '10 minute mile train' (driven by Greta) and the 8min 30 mile train, driven by experienced marathon train driver Alister, and all trains (as well as plenty of Striders 'lone wolves') had their photo taken in then assembled in purple clusters waiting for the start. After the minute's silence to remember those affected by the Boston bombings, we were soon away. I was a bit overcome at the start and began chanting some of the inspirational marathon quotes I'd looked up during the week (such as: 'Run the first part with your brain, the second with your personality and the last part with your heart' and 'In the first half don't be an idiot, in the second half don't be a wimp!') before I thought I'd better shut up before the others tripped me up and ran away without me! The first mile rocketed by. We were supposed to be jogging at 11 minute 30 pace each mile, but it felt so slow that we kept having to rein it in (well, rein Jill in - she was off like a whippet! 'Rein it in, Mrs F - you'll thank us for it at 20 miles', 'I know, I know, sorry!). We got some strange looks when all seven of us came to a halt at the Mile 1 marker and took our minute's march, but we kept reassuring spectators that it was all part of the race plan. Mile 2 and 3 ticked by quickly, too, and we picked up a couple of extra passengers - Mike Elliott got on and off the train throughout the first part of the course, and we acquired a lovely lady called Ally who was nervously running her first half-marathon and stuck with us for a while. We collected drinks at each drink stop, managing in most cases to navigate the weird water pouches that choke the unwary drinker, and chomped down some gels or chews ready for later. We enjoyed seeing the other Striders pass us on the switch-back sections, and had a good shout and cheer every time we saw someone we knew. We smiled for all the cameras and thanked all the marshals, high-fived a few kids and generally had a jolly time. At about 8 miles we saw both the other trains pass us and gave them a big shout out - smiles all round at that stage. Unfortunately at about 9 miles we lost Ally - she stopped to see her husband and fell off the back of the train - I hope she finished OK as she was doing great up to that point. On hitting Barnes Park the conversation had gone a bit flat, so Jill started a game of 'the ABC of wine' to keep our mind off things, and we enjoyed a couple of big cheers from spectators Jan and Tony - thanks, guys! Before long, we were heading back towards the Stadium and were approaching halfway, all feeling pretty good with the jog a mile-walk a minute working out exactly as planned. Last year, the route came right past the stadium at about the 18 mile marker so we got to see the front runners coming in, but this year the first loop was shorter and we cut around away from the stadium and away from the finishing half-marathoners, being cheered on by some Striders and a couple of Crook AC runners as we passed. Just before 14 miles we spotted Katherine and Mark Preston and we unloaded some kit onto Katherine and posed for some of Mark's fantastic photos (thank you, Mark!). All was still well at that stage. I was a bit apprehensive approaching the coast as this was where I fell apart last year, but things felt fine and the company was great. As we came up to Sunderland Uni, Jill suddenly realised that she was running a marathon (she hadn't realised this during the previous 15 miles!) and she had a little moment, and we kept smiling. The loop up and down to the waterside at around 15 -16 miles, however, was quite tough and we took a couple of extra walks to try to keep the train together. We stuck it out until about 17/18 miles, heading along the coast, when the rain started to come down and the train started to splinter. Jill and I were finding the walking hard going on our knees, and a couple of others were finding the running hard going so the train was no more. I headed off with Jill up the hill and into the horrible downpour, on target for about 5 hours 10 minutes, which was great going for what we had planned. Once the rain stopped we found a good pace and we ploughed on. We spotted Neil Sleeman on his way back towards the stadium and gave him a big cheer (and got one in return) and we pressed on past 19 miles. I braced myself for the wall that hit me (fell on me?) last year, but mile 20 and 21 ticked past, still walking a minute in every mile (and a bit extra up hills) and still making good progress with no hysterical crying. By 22 miles we know we were going to finish, and even though we each had a really tough mile, by the time we reached 24 we started to speed up on the running sections, but still took the walks when we needed them! Realising we were at mile 25 was a great feeling and we started to grin. It was fantastic to see Sunderland parkrun's David Whitmore waiting for us just before we had the Stadium in sight, and he escorted us for a bit on our run in. Then it was around the corner and up the hill and we could finally see the finish and the great crowd of Striders cheering us in. You can see from Mark's photos how pleased we were! We were both a bit emotional as we crossed the line (some of us more than others...), and very shocked when we realised we'd come in in just over 5 hours. This was only 10 minutes slower than last year for me - and a heck of a lot less painful - and a more-than-respectable first marathon finish time for Mrs Ford that she's sure to smash in her next marathon. Sue followed us in not long after - bloomin' amazing after her sterling efforts at London the week before - then the two Jo's and Mike. We got back around to the Striders cheer point just in time to cheer in Katie and Rob, both proudly finishing their first ever marathons with Striders smiles on their faces. 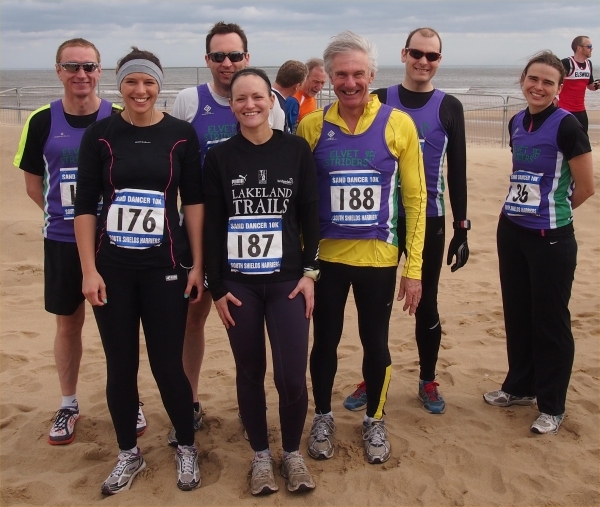 Great company, a great atmosphere and a great Striders day out. My London Marathon entry's in for next year! 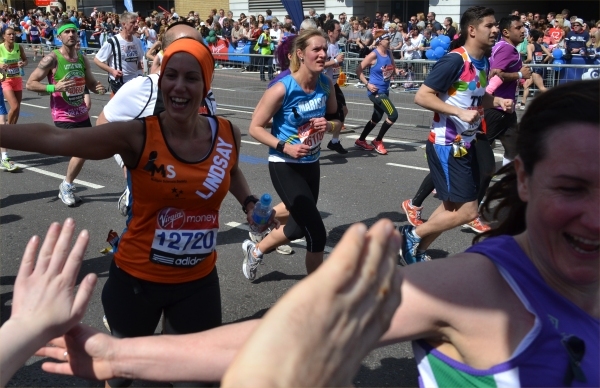 Completing a marathon has been an ambition of mine for quite some time. 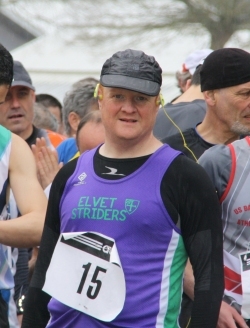 After recently joining Elvet Striders and having a big birthday this year I thought 2013 should be the year I gave it a go. 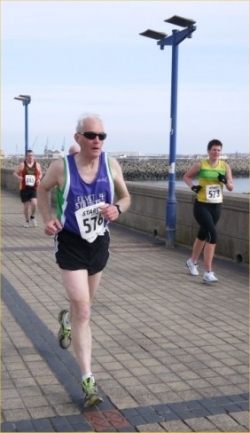 Being a newcomer to racing I really hadn't a clue where to start looking for a marathon so thought I would take a look at the Grand Prix races on the Striders website and saw there was a marathon at Sunderland. Perfect ... close to home, bound to attract lots of Striders and their supporters and the bonus of GP points up for grabs! The week before the marathon I was feeling quite nervous, unprepared and not quite sure how to tackle this gruelling race. Furthermore I had developed a worrying pain in my calf. However, after a super pep talk by the lovely Jacquie, including a few inspirational quotes and foam roller advice, I was feeling confident that I could finish this race and maybe even enjoy it. Race day came and I was up bright and early and jogged round to my friend's house (thanks Michael!) for a pre-race massage to try to help loosen my sore calf ... gosh physio before a race. I felt like an elite athlete! I met up with some other Striders at the Duke and we were on our way! 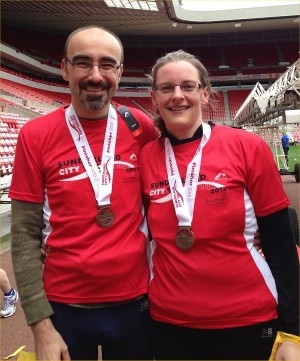 We parked right outside the Stadium of Light, soon met up with a sea of purple for a photo and then I found myself on the start line of a marathon on a rather cold and blustery day! After a minute's silence to remember those affected by the Boston bombings, we were off! The first mile was a bit of a blur but I remember having to hold on to my hat in the wind and thinking that this was not going to be easy. I settled into my target race pace (8:15) and began to relax. I had decided to split the race into 5 mile chunks and not to think how far I still had to go. The first 5 miles passed by quickly and I 'rewarded' myself with a delicious gel. I'd much rather eat a lovely piece of cake or flapjack but figured I'd soon get fed up carrying a rucksack full of treats so gels it had to be! Heading towards the 10k marker I got a cheer from a friend running in the relay which picked me up and this was soon followed by waves from fellow Striders Neil and Matt already heading back along a switch back section. I soon found myself entering the lovely Barnes Park and once again saw Matt running in the opposite direction! By this point (mile 10) I wasn't feeling as fresh as I had hoped and little doubts were being to creep in ... but then I had a cheer from Alister's 8:30 train ... and suddenly I found the lovely Jan running beside me forcing a jelly baby into my hand and saying to everyone 'Sorry I've only got enough for Striders ... you're looking great Rach!' Thanks for your support Jan - much appreciated! After leaving the Park I got back into my stride and exchanged waves with Greta's train and a few more Striders along the route. I also got chatting to another marathon first timer which helped pass the time before heading towards the Stadium and the half-way point. I was a little concerned at how I might feel when I split off from the half marathoners but as the bodies thinned out I felt I was running well and started to feel a bit more confident. Around mile 14 I was greeted by cheers and waves from Katherine and Mark Preston. Thanks guys and great photos! I enjoyed the next downhill section to the waterside and spotted Alister's train again as I struggled back up the hill. Heading down to the coast was the most enjoyable part of the race for me. The wind was behind me, so I felt I was flying down that hill! I knew I had to make the most of it as I'd soon be running back up, so I lengthened my stride and really enjoyed the run down. I soon settled back into a sensible pace along the seafront and enjoyed the views and fond memories of a wonderful day spent with my children on that very stretch last September. Turning round at the switch-back was a cruel awakening as the wind hit me like a brick wall and I battled back along the seafront. I made it to 20 miles, refuelled and took on some more water. I don't know how many of those damn water pouches I opened but I never did find the right technique as they either sprayed all over my glasses or I could barely get anything out of them or so much shot out that I choked! Once I reached mile 22 I was confident I was going to finish. I passed Alister and Graham at a switch back around 23 miles, waved and got a 'just a park run to go' from Alister. Shortly after a lady shot passed me and, although I knew I couldn't catch her, I thought I would try to kick on and my legs responded. Glancing down at my Garmin as I ran through Roker park I was at 7:30 pace ... didn't last long! Turning back along the seafront I hit that wind again and everything came to a grinding halt. There were quite a few men ahead so I dug deep and tried a technique I used in rowing ... the 'hook and wind' ... pick a target ahead, throw an imaginary hook and wind them in.it works for me and I managed to overtake a few people! Katherine and Mark were at the top of the hill cheering me on ... sorry no smiles this time, just a determined race face! Then it was a final kick to the stadium, helped along by a few 'looking strong Strider' cheers. That last 400m hurt but what a fantastic feeling to cross that finish line! I had completed a marathon and was pretty chuffed with my time too! Would I do it again ... well as I got a 'good for age' time to qualify for London it would be rude not to! I was anxious about this race, it was planned as a training run for the Edinburgh Marathon in 4 weeks, and over the past week I'd been struggling with various niggles and pulls in seemingly every muscle. However, a trip to Neil at Platinum Physio, some sound advice from various Striders, foam rolling, ice baths and a few extra days rest eventually got me to the start line. We were greeted by grey clouds, and a chilling wind that didn't seem like dropping. As such we huddled inside the stadium in anticipation, before being lead outside (where, we soon discovered it was warmer than inside) for the accustomed Strider group photo. I hadn't initially thought of a time, aiming just to get round uninjured, and use it as a vital training run. As adrenalin pumped and I mingled with Striders, my game plan changed. I hadn't ran an 'official' half since GNR 2011, where my PB was set at 1:57, long before I was a Strider. Time to change that. I was aware that various marathon runners, usually running at pace too quick for me, were aiming for a swift time. If I could stay with them for the half, that would almost guarantee me a half PB. After an emotional minutes silence for the recent events at Boston, I honed in on a certain Alister Robson, and tried his pace. This felt good, probably quicker than I would have chosen, but I was with the pros here. I settled into the pace, checked my form and posture, my breathing was good, I was set. The niggles in my legs soon faded after about 2 miles, and I felt good. And thus we were well on our way, weaving through the scenic delights of Sunderland. And what an enjoyable race it was, the passing and greeting of Striders on other sides of the roads and parks, offering shouts of encouragement, along with the friendly banter from Alister, Graeme and Megan made for a very satisfying run. I was surprised how quick it went, I wasn't aware of every mile point, and fairly quickly we were at 7 miles. I remained comfortable throughout, everything felt good. I stayed with the group until around mile 12, with great encouragement and with the final bridge in sight I upped my pace, leaving the marathon runners to do their thing. I kept up a strong pace over the bridge, around the corner (and another corner, which I hadn't accounted for) and made for sprint past the literally tens of people applauding. The time on my watch advised me I'd beat my PB by a decent 9 minutes, coming in at 1:48, so I was chuffed. The end was a tad confusing as I found myself in various queues, with seemingly no purpose apart from what appeared to be a box of bananas. As it was I then selected my shirt from a pile on a desk, was awarded a medal and goody bag (containing toothpaste & shampoo), and went off to find some pals. Back outside, and I confusingly joined more anonymous queues (one for a massage, and another for more bananas it would seem). It was great to be able to catch some Striders passing to continue on the rest of their journey for the full marathon, all looking so strong at their halfway point! The organisation at the start and finish could do with revising, but hopefully this doorstep event will flourish and evolve, and the road running community will realise there's more to the North East than Newcastle to South Shields! Editor's note: Congratulations to Christine Farnsworth for winning the 1st Female Vet 60 prize, namely a £50 Start Fitness voucher! Well done Christine! Ed. If you had told me a year ago I would be entering a 10K, I would have laughed. Yet on a freezing cold blustery Sunday in April here I was standing proudly at the starting line about to start one. My entry into this race was a late one and blame is entirely laid at the feet of Jacquie “Mistress of Pain” Robson who had told me about late entries still being open and encouraged me round my first Striders session only 4 days previously. 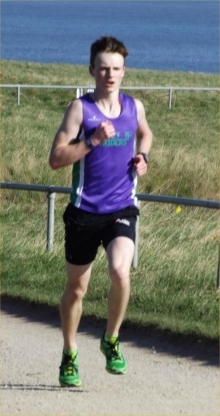 Buoyed by my first ever sub-30 5K at Durham parkrun the week before that (just had to get that in here, sorry!) I figured I would give it a go and having persuaded my long suffering partner Jon to ditch his bike and enter his first ever foot race too, here we were. Mindful of the fact that the last time we went to the Stadium of Light it took us 4 hours to get out of the carpark we had parked out at South Hylton and got the metro in. The first one pulled away as we were buying tickets so we had a further 20 min wait in the cold for the next one but other than our poor timing it worked fine and we made our way to the stadium. We managed to catch Alister and Jacquie to say good luck before heading on a fruitless search for the Race Information Cabin, according to the Stewards it was impossible to miss but miss both the cabin and large luminous sign we did and instead enjoyed a warming constitutional around the stadium before happening upon it second time round. We waved the serious runners off then, with numbers pinned and the temperature rapidly dropping, lined up at the start in scenes reminiscent of penguins in the Antarctic huddled together for warmth. My aim for the race was firstly to get round without pulling my slightly dodgy hamstring, and secondly to try and do it in under 1hr 10. After a minutes silence for the victims of the Boston Marathon bombing the gun went and we were off. There were no pens or timing boards so the start was a bit of a scrum with faster people at the back trying to weave in and out of those of us taking it a bit more steady. The route was rather nice, over the big green bridge and through the centre of town, then a bottleneck into a pretty park before heading back over the bridge and down to the river. I realised at the 1km marker that my trusty runkeeper had decided not to work and hence I had absolutely no idea what pace I was going. This was a bit scary since I am a bit of a slave to timings and running without this was quite disconcerting. However the km markers were visible and I felt ok so decided to keep going rather than stop and try and fiddle with my phone along the way. I’d finally warmed up by the time we hit the riverside, helped by the steep uphill towards the harbour. It was then mercifully flat for a good couple of km along the sea front and the field had also thinned out which was something of a relief. At about 4.5km I realised that I could use my heart rate monitor as a watch to get an idea of the time so switched it on to watch mode just in time for the 5km marker and was delighted to see that I had done the first 5km in about 30 mins, which was not bad for me at all and I started to idly dream of a sub 60 min 10k. This got me up the big hill and into another rather nice park where runners were being entertained by a rock band in the bandstand. After the park there was another road section before turning a corner and then running right into the teeth of the howling wind. This bit was hard because of the wind and seemed slightly uphill too but I pushed on knowing there was only a few more km to go. With about 800m to go I still hadn’t seen the stadium but then suddenly there it was and I was on the home straight. I don’t do sprint finishes and certainly not with a dodgy hamstring so I waved at Jon (who had found somewhere to spectate after finishing in a very respectable 50:30) and crossed the line serenely with the clock showing just over 1:03 (chip time 1:02:40 – I am very pleased!). We bumped into James who had just finished his half in a very good time, had a quick chat to him and then joined the surprisingly long queue for medals and goody bags which were being handed out in the stadium. An imminent golf lesson meant unfortunately we were unable to stay and cheer the rest of the Striders home but since we (once again!) just missed the metro we did stand and cheer people on outside the station, including several striders, and were inspired enough to consider running here again next year but this time go for one of the longer races. I just hope it is a bit warmer! Last Friday I’d booked the day to go running in the Howgills with a good mate and then race the Lakeland trails Hawkshead Trail race on the Saturday. Unfortunately the Hawkshead race was full by the time I got around to entering but never mind, my mates Howgill Harrier friends Georgie and Husband Rob who had joined us in the hills on the Friday were heading off to Wray 10K and a lift was offered. I’d never heard of this race to be honest and all I could find about it was lots of stuff about scarecrows. Dropped off at said Howgill Harriers friend’s house near Sedbergh early Saturday morning it took about an hour to get to Wray which turned out to be a tiny country village in between Kirby Longsdale and Lancaster. Quick tour of the fabulous scarecrows many depicting various children’s favourites such as Jack and the Bean stalk and Rapunzel but many ironic, bizarre and quite frankly surreal. I loved it as much as hosts friends three and five year old kids! The race reminded me of Kirby Malzard 10k which I did a few years ago and most make an effort to revisit sometime. A simple no nonsense 10k taking in the around the lovely roads near the village to raise money for the village funds. A fiver to enter, a whole £1.00 more for the entry on the day but still a bargain! 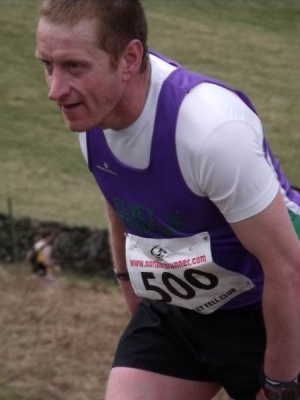 Very hilly affair and with Sunderland Marathon the next day in mind I should really have taken it easy but I don’t do many 10K and I had been reminded how much my Howgill harrier friend had beaten me by at the last race I had seen I was up for a good race. Well marshalled, lovely country roads, picturesque villages, some very decent hills went past in a bit of a blur, eyeballs out stuff trying to close the gap on Georgie most of the way but alas it wasn’t enough as I was beaten again. Bacon buttie at the finish, ice cream for the kids and a grand day out. 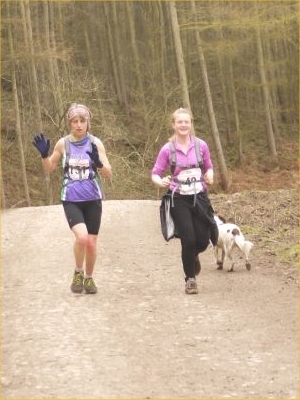 Hawkshead 10k Trail Race (well 11.8k on my watch). 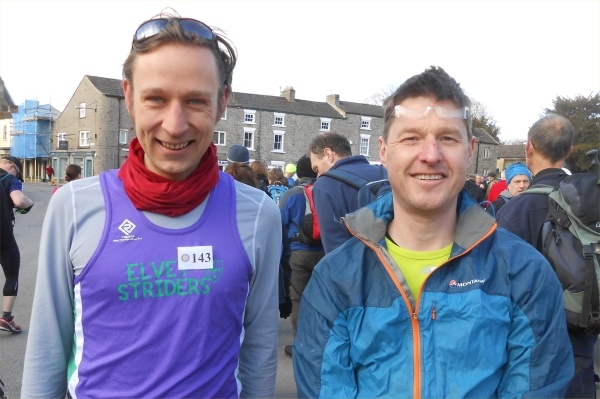 We’ve already done a trail race in the Lakes last year so thought we’d do the Hawkshead trail race as it is held in April and should be warmer than the other race we had done in November, how wrong we were. 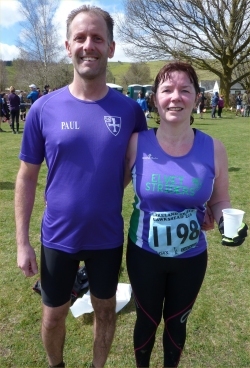 Actually it was quite warm on the day, the sun shone and we were able to run the course in our Striders vests – our own by the way not someone else’s! We met a couple of friends who were also doing the run and set off to the fantastic beating on the drums of the race band. The organisers had been working all week to make sure the races went ahead as due to the British weather there was a lot of excess water shall we say. We headed off the opposite way from the start onto the road skirting around the outskirts of Hawkshead towards private land over fields and plenty and I mean plenty of stiles (at least 6, and a double one at that). Once at the top of the fields, if you managed to look up to avoid the mud the views were absolutely stunning. From the fields down country lanes and then past Wray Castle onto the track along Lake Windermere which was gorgeous and you could get back into your stride after all the muddy fields and lanes but didn’t dare get too complacent as up ahead was the infamous ‘Coffin Trail’. A mile long hill of trail with an encouraging volunteer on a microphone so far up assuring people that the hard part had passed. You could run up the trail, if you so wished, or just got your breath back and jogged along the slightly flatter parts of the hill. Once at the top of the hill, well what I thought was the top until you crossed the road and realised you were only half way, it was downhill to the finish. Well downhill, across a waterlogged field, past some cottages, onto the road past the campsite, past the shops along another road then into the finishing grounds and a near lap of the field. All in all 11.8k was recorded on my Garmin, Paul got longer around 11.87k but assured me I must have taken the racing line! For all the mud, water, Coffin Trail I would recommend this run, it is in gorgeous surroundings and the volunteer and set up was spot on. No medals I’m afraid but a fantastic technical tee and lemon drizzle cake afterwards. Also well done to the 17k ladies and thanks for the cheer on at the end. Well done to everyone who took part in the first handicap of the year. 41 finishers and a good few others joining in for a lap. Luckily the waterproof clipboard wasn't required unlike last year's atrocious weather but the lack of mud didn't seem to hamper anyone's fun. A big thankyou to Sue and Angela for help with the results, Alister for taking some great photographs, Greta for leading out the race and Mike for helping with identification of finishers. With such a good turnout and mass finishes at times I hope everyone agrees with their times but if you think I'm wildly out let me know and I'll look into it. The next handicap will be 22nd May. Remember you can run as many or as few handicaps as you like so please join us next month if you can. I thought long and hard about giving this one a go with next weeks marathon in mind but there where Grand Prix points up for grabs after all so off I went with the reluctant Katy with me who was treating this as her long weekend run! We arrived at Gisborough Rugby Club with time to spare, collected our race numbers and chilled for a while. Other Striders appeared including Shaun, Jan, Laura and Tom. I had a brief discussion with Shaun regarding suitable footwear and decided to go with my road shoes as the weather had been dry for a week or so and the forecast for the run was fine. Eleven o'clock soon came around and after a quick word with Phil who had just arrived we were off. Now I am relatively new to fell running (this being my third) so it's all rather exciting at the moment. I think once you know what to expect the fear and dread will worsen! [It does! Ed.] The start was uphill unsurprisingly, climbing up relentlessly before flattening out after a mile or so. I had a plan to keep Shaun in sights so that he could pace me as I have benefitted from his experience in the past. Now it seems to me that fell running is all about knowing when to spend your energy and when to save some. I followed suit with Shaun on all of the major climbs by adopting a fast walk policy as this seemed to be equally as fast as trying to run them! The terrain varied, with each surface giving its own challenges. I found running across the fells particularly tough with each step having to be carefully monitored. Coming down from Captain Cooks Monument is crazy with the more experienced fell runners absolutely flying without any fear at all! A welcome drinks station was to be found at the 6 mile point before once again another climb. This was followed by a long gentle incline, a steep downhill section and there it was in front of me, Roseberry Topping! Well I think I ran the first 10 metres and walked the rest. I quick natter to Shaun on the way up, a look around at the summit and then for the tricky descent. That was quickly followed by "Little Roseberry". The rest of the route was relatively flat with some more boggy fells, a steep uneven downhiller before a nice fast finishing section. I was very happy to stop my watch just short of 1hr 50mins with Will (4th place) and Tom already in, and Shaun not far behind me. Phil came in next followed by Katy looking absolutely shattered but still smiling. 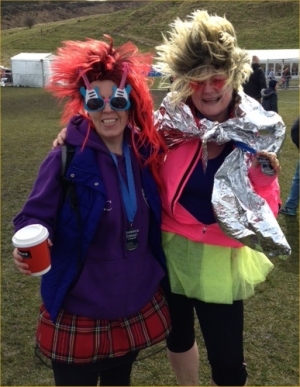 Jan and Laura made up the rest of the Striders finishers. All in all an excellent race, well organised, not for the faint hearted but very satisfying. Dave Gowans has taken a nice video of the final descent through the woods here, where a fine variety of descending and mincing techniques is on show. Ed. Having seen Alister’s email about this race during the week and promptly ignoring it as today was meant to be the last long run before Sunderland next week I sat down to watch the London marathon and suddenly had the urge to race. Called Alister back to pick me up and we were off to Wallsend. Due to the rather rushed exit to the house and also having no idea what I can run 5K in these days as haven’t raced one properly in about 18 months I stood on the start line with no watch and no idea what time I was going for. Also at the back of my mind is the marathon in a week’s time and the fact that I’d had to drop speed training from my plans due to my legs rebelling. We’d thought that the course was flat as it had been described as a potential PB route but there was talk of hills, sometimes a lack of local knowledge is a good thing. First K and Alister was quickly away into the distance, no worries it would have been stupid to try and keep up with him as there is no way I have the speed in the legs but managed to tuck in behind a Jarrow and Heburn runner who I have frequently finished close to in 5Ks in the past. Down a hill and onto Hadrians way we started the drag to regain the height we’d lost, well if this was the hill they were on about it there was nothing to worry about. Past the 1K marker and felt I could/should be going a bit quicker so set off after a couple of Sunderland Strollers lads who were having their own battle. At the 3K mark you pass the finish and go onto a slightly modified second lap, so back down the hill and up the drag and I’m now stuck between the two Sunderland Strollers. By 4.5K I’m wishing the race to be finished, remembering just how much I hate 5Ks and actually looking forward to the chance to run a marathon next weekend but there’s no easing off as I’m pushed all the way to the line. Despite it not being completely flat and having a few twists and turns this is definitely a fast course as Alister proved a great run to finish with a seasons best. Good if rather bright T shirt for finishing I’d definitely considering re-visiting this race next year. The day had finally arrived. The day we had trained for. The day of the London Marathon. I wasn't feeling like I'd rested as much as I would have liked over the past 48 hours but nevertheless, I was up, getting ready and raring to go (well, maybe 'raring' was a tad exaggerated). Steph and I had a hearty bowl of porridge to keep us going before we set off on our journey to the start line ... Thankfully, we only had to use the tube for a couple of stops and then we were lucky enough to blag a free ride in a taxi to as close to the Blackheath start (blue zone) as possible. There, we were met with the crowds of fellow runners and spectators - this was really happening! The sun was out in force too - this was a little worrying as most of our training was done in low and sometimes minus temperatures. After finding our way through the masses, we arrived at the blue assembly area, where we didn't have too much time to wait before bags were loaded onto the baggage buses and we found ourselves in the toilet queues. This is where we spotted a fellow Strider - Margaret. The queues went down quick enough but pretty much as soon as we got turned around and grabbed a drink we were back in them. 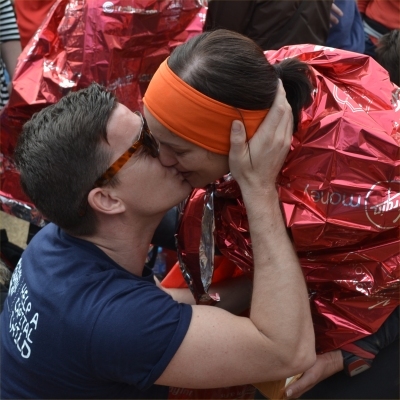 I couldn't believe the support around the course; it was simply amazing! It was the first race I had participated in where my name was printed on my running top and the boost from the crowd certainly spurred me on. The first half felt great and we were met by our family and friends at around about this point (just after crossing Tower Bridge) - which was perfect! I mentioned earlier how sunny it was ... well, it was unbelievably hot, especially since there was no breeze or cover for the majority of the route. I longed for the sporadic shaded patches we came across and the welcoming showers. From about 18 to 20 miles, Steph and I were beginning to feel the pains and felt unable to keep any sort of consistent pace up (as hoped). I just settled back and enjoyed the atmosphere, knowing that I wasn't prepared to do myself an injury or jeopardise my health from pushing myself to an uncomfortable level of running; especially with the heat pounding down on us. I don't normally take on board much water when racing but I was rarely without a bottle and found it a great comfort. Two and a half gels into the race I was starting to feel the lethargic legs and was so glad of the family support again at mile 23 - it's what kept me going until the finish - 4 hours 26 minutes I crossed the line. Three minutes slower than my Liverpool time in 2011 but my Garmin read just over 26.5 miles and so I allowed myself that extra time. The support was to be applauded alongside the organisers of the event - an absolute pleasure to be a part of. Awaiting the arrival of friends and family at the meeting area, I was in a heap on the floor, eating my pistachios and longing for a hot bath; not wanting to think of the journey home or the fact I had to work the next day. Soon they arrived and after the initial emotional embraces Daniel got down on bended knee, pulled a ring out of his pocket and proposed. The pain in my legs subsided, the tears flowed and I said yes! There were cheers around us, approved clapping and a few photos. Walking the GR221 in Majorca last year with my walking mate Clive we were confronted by several hundred runners on a narrow mountain path going in the opposite direction. This took some careful negotiating to let them all past while still allowing us to continue our walk and not lose time. Upon our return to the UK, a quick search on Google informed us the race we encountered was an annual event consisting of 2 distances, a 100 km 24 hour event plus a 60 km 16 hour with 4800 and 2500m climb respectively. Forget the tourist side of Majorca and think of towering limestone crags, rugged coastlines, ancient olive groves and mix this with the smell of orange blossom and old Majorcan villages and you begin to get a feel for the potential for the event - just a matter of staying on your feet for a few hours. Taking into consideration our knowledge of the terrain and our level of fitness we opted for the shorter course. We signed up and paid our 80 euros. The 800 race entry was full within approx 2 weeks. We decided 12 hours would be a comfortable time estimate so that was our aim, also to stick together during the race so when one of us began to flag the other would take over. With a rousing send-off we started out with the 800 others at 8 am on an uphill climb out of Valldemossa. We started out on granite paths through the Holm Oak woods before eventually dropping down into Deia. Temperatures were low for this time of year, around 17°C, a light cooling breeze and good cloud cover made for near perfect running conditions. We made good time to Deia, quick pit stop at a well stocked food and drink station then onwards and upwards towards Soller. More views and orange blossom scent, then a quick stop in Soller. Now for the hard bit, the climb out of Soller, 800m climb with no let up towards Lake Cuber. More stunning scenery, by now we were able to take this in as we were walking this section. Feeling somewhat nauseous still managed to force food and liquids down and again we were off. This was about the halfway point, with most of the climbing done. We remained at a high level for much of this section however there were still a few more short climbs involved. Plenty of encouragement along the way, including being serenaded by Spanish bagpipes at highest point of the race, anointed by a ‘priest’ with a toilet brush, flute music drifting down the path etc followed eventually by the long descent. With quads groaning by now we jog/walked and picked our way down the rocky path. The descent went on forever. Eventually we got to the monastery at Lluc where we took a 15 min stop. By now it was late afternoon, the sun was fully out, skies were clear and temperature still ideal for running. The remaining 10 miles was a mixture of tarmac roads and paths, the tricky bits were out of the way and it was just a case of putting one foot in front of the other without having to think too much. We were reduced to walking for most of this section due to fatigue but managed to break into a run for the last mile and overtake a few stragglers. Upon entering the town square at Pollenca we were met with a huge cheer, I looked around but it was only myself and Clive in view. You could have thought we were the winners. We checked our time and place as soon as we finished then struggled to the food tent for beer and pizza. Time was just inside 12 hours, position 411 and 412. (Can’t seem to find the results yet so we don’t know how many finishers there were). All in all a great event, food stops, route marking, marshalling were all excellent and the scenery and vocal support superb. Karin and I arrived to beautiful weather conditions on the coast and a spectacular view. From a deserted promenade at 8.25 to swarms of runners at 8.45, this looked like it was going to be big. I had originally target this as a PB attempt but rumours of it being 'deceptively undulating' and open to wind were putting severe doubts in my mind. Crossing the line in 17.40 by my watch, a 2 second PB! No idea how I've done that, but this is a lovely parkrun, the view whilst I was collapsed on the floor was lovely. On a disappointing note, this is my 5th second place finish in 5 previous attempts. The only way is up though. Louise looked strong coming in not too far away from her PB on a day when heat made the work a bit harder, despite the lovely course and cracking views. Other runners were Kevin, Mark, Alister, Geoff, Susan, Stan, Dave and Karin. Apologies to anyone I've missed out, but everyone seemed to enjoy what was an awesome parkrun, definitely worth a visit. Another trip down to see my sister gave me an opportunity to try out a different parkrun than normal so it was off to forest rec which is a large recreation ground just on the edge of Nottingham City centre. I'd had a search on the web and found a video of the route which showed it to have some tough climbs in it so my my plan was just to have a steady run around instead of killing myself for a time which I did at Newcastle the week before (which could only be described as brutal if I'm being honest). After a short and friendly briefing from the Run director we were ready to go. I had a look about to see if anyone looked like they would do a really quick time but decided that i would try and go with the front few and if it was too fast then i would just ease off and jog round. 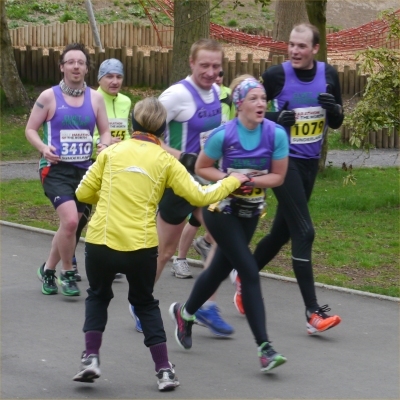 After negotiating a chicane due to building works I was in a group of about 4 with a female runner in the lead about 5 metres or so ahead as we ran onto the fields. The pace was about 6min 30sec pace which is just over the 20min mark for a parkrun which is OK for me at the moment so the steady run plan was out the window. As we looped around the fields I started to catch the front runner going past her just as we get to the first hill. I pushed up the hill to see if she would respond but I was on my own. It felt a bit odd being at the front of a parkrun with everyone following me, I was not sure if I should really increase the pace or just try and maintain the gap (I've never been at the front ever !). As it happens I did the right thing by just increasing slightly as the run contains a couple of tough climbs as you make your way around the top of the park and it's also a two lap course so you have to go back up all the hills. After the last hill you have a downhill section and a guy came past me I thought that may be my one moment of glory gone and my heart sank but I just stuck behind him as we went around the fields for a second time. As we approached the end of the fields I went past him again and decided to push it hard up the fairly long climb and start hoping for the best (driving those arms as Adam mentions in his reports). At the top you have a steep and short downhill section before you hit the last climb which is short but the steepest part of the course. I had no idea how far ahead I was and I was never ever going to look behind (its a tell tale sign you're struggling) but I could not hear any footsteps. After the last hill I had a downhill section which I just went flat out on doing a sharp turn before heading for a 200M+ sprint to the finish This felt fantastic as I knew that I had it in the bag then crossing the line in 19:43 exactly a minute down on my run at Newcastle but I did not care! As Adam touched on in his report you need a slice of luck to be first finisher at a parkrun, I'm sure runners in the Nottingham area will look at my time and think I can beat that so I'm sure that next Saturdays time will be much quicker than mine but this week luck was on my side. What a great feeling it was getting a positon token with the number 1 on. Those painful Wednesday nights on the track really do work. 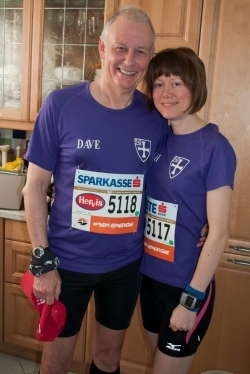 These days I do not get nervous before a marathon, however Vienna was different. It was my first road marathon and I was not sure how I would cope with the impact of running on a hard flat surface for so long. This was also my chance to go for a time, so I had piled pressure on myself to do well. As we waited at the start I was concerned with how many people there were and the bottleneck this could create. It was also very hot and I started to have doubts about achieving a sub 4 hours 30. I liked the start of the race which took us across a huge bridge over the Danube. The crowd seemed to be moving at the target pace I had set myself despite it being congested. However that pace did feel a bit slow but I decided to stick with it until the halfway point as I did not want to end up dying early on. I nearly lost Dave twice at the first two very busy water stations but Dave is pretty tall so I was able to spot him amongst the crowds. I enjoyed running past the historic buildings and they were a good distraction from the fact I was running on the road. At the halfway point I still felt as if I could be running faster so I made the decision to continue on my own for the rest of the race. Running also got a bit easier at this point because the half marathon runners had finished so there was less chaos at the water stations and hardly any more weaving to get past people. The second half involved an annoying out and back section, however I kept my eyes peeled for Dave coming in the opposite direction which helped as a distraction. At mile 20 I was amazed how comfortable I was still feeling so decided to increase my pace further knowing that even if I did burn out a bit there was plenty of time for me to be able to make my goal. I was also feeling pretty happy at this point as I realised that I was going to make it around in the the time I had set myself. I found the last 5k the toughest and it felt like I was not getting any closer to the finish. I must have been checking my watch every thirty seconds or so which probably wasn’t helping. However about half a mile from the end I realised I could be in for a sub 4 hour 20! I knew it would be close and as soon as I saw the sign indicating that there was only 400 meters until the end I started to sprint. It is a fantastic finish which goes through the arches of the Hofburg Palace and I made a point of trying to take it in as much as I could even though my body was now screaming at me. I crossed the line in 4 hours 19 minutes 29, far better than I had hoped for or anticipated and an hour knocked off my marathon PB time!! I felt ecstatic and celebrated with an alcohol free beer which was handed to me at the finish. Looking at my results I did the second half over five minutes faster than the first half. I think if I had paced it better I may have been able to do it a bit faster. However I am more then happy with my time and do not plan to try and beat it any time soon, if ever :P. Plus it is nice to hold my PB at Vienna. I am glad I did a big international marathon. However I am looking forward to going back to our off road adventures adventures with less crowds, less impact and checkpoints with food. "A scenic run on a multi terrain course", sounded appealing enough to me so off we toddled on a bright and breezy Sunday morning. As usual I arrived nice and early with wife and kids tagging along. Registration was painless and we settled down in the race HQ with a nice cup of tea. We hadn’t been there long when a few more striders began to appear. Now let it be said at this point that the wind was quite strong but little did we realise just how wild it was going to be on the course. We all started to gather outside for a few snapshots and it was then apparent what we were dealing with, the wind was blowing an absolute gale with the sand lashing against any bit of bare skin that was on show! Off we went, running parallel with the sea as the sand was whipping the side of our faces. Passing Alister he remarked that he had set off a little too quickly (a mistake that we all do just about every race). The first mile or so was a mixture of tarmac, trail and grass and was all very pleasant with one or two twists and turns and a few little ups and downs. I was averaging 7 minute miles and was enjoying it until BANG I turned into the wind! To make matters worse I was now going uphill as my pace dropped to 9 minute miles! I was mightily relieved to reach the top and turn to head back in the opposite direction although the wind was still pretty much side on now and not too pleasant. The route takes you round the same loop twice so needless to say the pain was worse on the incline into the wind second time around. I did manage to pick up the pace ever so slightly on the run in which is nice and flat and also includes a nice downhill section. The race finishes with one lap around the track in the athletics stadium where once again the wind took its toll on the back straight. I crossed the line in around 43:30 with my Garmin showing a distance of 6.12 miles. Alister followed me in shortly after with Michael coming in next. A superb run by everyone involved with brutal conditions making this a very tough race. A nice pint in the pub with some soup and a breadbun and same nice conversation made this an excellent day out with the icing on the cake being the football score! Super day! The Rock and Roll series of races is well established in the states and these are now being rolled out across other parts. This was the 2nd one in Edinburgh, replacing the previous Chris Hoy / ADT Half Marathon. It sounded fun and I liked the idea of 'bands on the run' at each mile point and the end of run music festival. After a sleepless night (got to sleep at 4:30, up at 6:30, the wind outside kept me awake!) with my friend Liz we got our fancy dress sorted out and with fake tattoos applied we headed to McDonald's for porridge breakfast. We did receive some funny looks and double takes by early morning risers, and street cleaners! It was a bleak morning with the wind and rain lashing, runners were huddled under the nearby Scottish Parliament building for cover. The race started and ended in Holyrood Park, right under Arthur's Seat. We tried to get cover from the howling winds, it was bloody freezing, portaloos were swaying in the wind and one blew over, a marquee was blown off its hooks and disappeared in the distance. The race started with pumping music and a staggered start for fast to slow runners which worked really well (5000 runners). I decided I would run in my wig and 'guitar' glasses (I did a little run around the windy field and all stayed in place). The route took us out to the coast and looped back again to the city. Unfortunately 4 miles in I had rather a nasty fall (and some nice knee and elbow bruises to show), Luckily I was right near some toilets so I took 5 mins out to check everything over and apart from a few scrapes and bruises all was in order to carry on although the glasses had to go! The race continued with a circular route around Arthur's seat, the last few miles took us through the various parts of the city, quite undulating and great for seeing Edinburgh. The crowds were really good and encouraging which really helped as my legs were feeling tired after 10 miles (I forgot the dextro tabs). The bands were great too and I found myself looking forward to each mile point for the inspirational beat. At a few points there was a man with a microphone shouting out people's names, high fiving runners. The last mile was an enjoyable sweeping downhill run onto the Royal Mile and back to the park. Unfortunately things went further downhill at the race end, there's was no goody bag for your goodies so you were left juggling various and there was huge queues for bags and t-shirts. Due to the horrendous wind the organisers had to take down some marquees, also the end of run festival had to be cancelled. After nearly an hour wait (couldn’t get myself a foil either) finally re-acquainted with bag and Strider hoody, never been so pleased to see it. But overall this was an enjoyable run, even with the American cheese thrown in. There were people from all over the world we spoke to who had come to it and whom were avid followers of the 'rock and roll series' and why not! My time was 2.15.03 oh! and the medal is rockin outta this world! High five! Me, Susan and Laura travelled to the Cheviots on Sunday to run up and down Northumberland's highest hill – The Cheviot. This was Laura's first 'proper' fell race and it was held in very challenging conditions (v.wet underfoot, a very strong wind and heavy showers) and, on the advice of the mountain rescue team, the race had to be shortened as a result (from 6 to 4 miles). Laura finished 3rd woman and ran a very brave race. She was none the worse for her experience and, after the race in Wooler, she enjoyed a hot chocolate piled high with marshmallows! Susan finished 2nd woman and I scrapped a top ten place. It’s a while since a managed that – I can recommend retirement!! I had missed this race in my wife's home town for a few years but with an early Easter I realised I would still be around. This was due to be my first competitive race for 8 months after some medical problems last year so with a few good park runs under my belt I thought I would give it a whirl. To be honest the preparation for this wasn't great. With the frozen arctic wastelands of Durham having sapped a lot of enthusiasm in March I hoped to pick it up in France. I planned to test out my slowly improving French by jumping onto a Sunday run with the 'Escapade de Malestroit' running club and they were very accommodating with a select group of us dodging through some 11 miles of woodland trails that looked like they were last used by the resistance in WW2. I was finding it tough and was well off the pace with a growing niggle in both hamstrings. I decided then to avoid further injury I would rest until race day and hope for the best. I always had a PB in mind as I had done the Great North Run in 2011 in 1 hour 41 so I was hoping for a fast flat course running at about 8 minute mile pace. The French have a saying "il pleut comme vache qui pisse"- it rains like a cow urinates! As I awoke on race day it was doing just that and the wind was howling around too. At 2.30 I went to pick up my race number. I managed to bluff my way through the obligatory doctor’s fitness certificate that all French runners must produce and then started warming up. And I needed warming. It was wet and freezing. 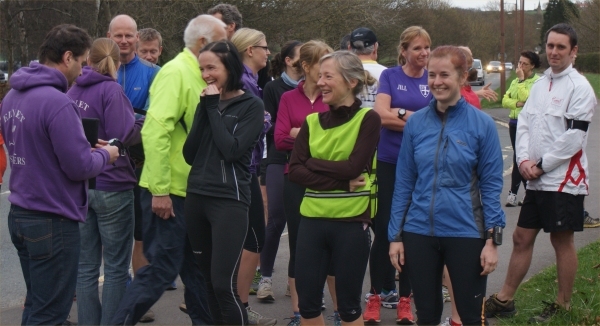 The turnout was low as a result as there were certainly no fair weather runners. At 3.30 some 300 of us set out to start on what, for some, was part of their qualification for the French national championships. Running at 7.5 min miles was the target and I was easily doing that as we pulled out of the sports centre across the river and out of town towards the village of St Congard. The route was along a road that in places resembled a river and it was not long before a race number malfunction slowed me down as I readjusted the safety pins on a very soggy ‘15’ sign. At park run distance I was going strong at 23.30 mins. On track to maybe get my new PB. But the wind and rain was coming in all directions. It got no better! At 10k I was on 46 minutes and still flying with not a single mile over 8 minutes. I was very happy as there was no sign of the stomach problems that had previously dogged me. Then at seven miles we turned into a village and started a short climb up a woodland road. It was then that disaster struck. I now know what the saying means when runners 'hit a brick wall'. My legs just turned to jelly, I ran out of steam completely and my times plummeted. I tried to keep going up what would normally be a gentle climb but this was becoming torture and I was struggling as I came to 9 miles on a very exposed hill. The rain and wind continued which is more than I felt like doing. Times were now around 10 minute mile pace and everything was coming to a grinding halt! I dropped down to the village of St Laurent and with a bit of water and a slice of orange I got a bit more energy but it wasn’t really enough as I crawled the last 3 miles. The thought of the chocolate eclair I skipped at lunch, waiting for me in the fridge, was all that was keeping me going. I passed the cheese factory at the 20k mark and hobbled onto the final part with thoughts of only finishing. Crossing the line in 1.53 it wasn't my worst but it did show me I’m still a bit off the pace as yet. Still that was not going to stop me tucking into my eclair. Delicieux! Perfect weather,cool,blue skies and no wind,so expectations were high as Mike Bennett and I headed down the A19 for the next race in the Esk Valley Winter fell series. Surely even on the tops of the Cleveland Hills there would be no more snow and ice to contend with? In reality it turned out to be one of the most pleasant fell-running experiences I have had so I would strongly recommend this race to others. Registration at the Pinchinthorpe Railway Station, in the carriage opposite the cafe, parking in a farm field nearby so no hassles, competitors seemed very cheery and enjoying the sunnier weather, many wearing just vest and shorts, with a relaxed attitude to kit requirements, though Mike and I both stuck to the trusted "bum bag and extra gear just in case" approach. The run started on the old railway line, now a popular mountain-biking route, before cutting steeply up through the woods on the first of only two significant hills. A long,dry trail along the ridge/tree line followed, great views across and before a steep dip and ascent no.2, then a stretch across the moor edge, rather bleak where forestry has recently been ripped out, and clearly very muddy in recent times, but fortunately not so today!! A sharp left and a descent to the Hanging Stones came next. Pre-race instructions had included time penalties for taking short-cuts and the fact that we had to touch one of the said stones, all sounded very significant, possibly complicated and taxing, but in reality you couldn’t miss them and giving one a pat in passing was straight-forward. It was then a steep descent through woods, including some very greasy bits, some wiggly 'where does the route go' next bits (some folk did get lost too: I came across a couple from NYM club who had gone completely the wrong way) then a lovely, gradual downhill through woods past the Blue Lake, and finally a couple of miles on farm tracks and old railway lines to get us back to Pinchinthorpe. It was about 10k with 900 feet of climb, very runnable overall. Mike had a storming run, I plodded round at the rear. Great stuff and only £6 a head. Bring on the summer series - keep an eye out for car sharing to mid-week races if you fancy it. As it was a nice day I thought I would take Judy and Holly to Monkey Hanging country for a day out. Met up with Karen Chalkley and went to register aboard the PS Wingfield Castle. Karen looked after Holly dog whilst I completed the paper work on looking round they had disappeared only to be found on the gang plank, they had been hoyed of the boat because dogs were not allowed. Maybe Holly could have been the ships cat in disguise. Next we bumped into Captain Ali and Secretary General Jacquie. Leaving Judy and Holly to look after the car we toddled over to the start and were overtaken by the starting gun on wheels (a cannon) so I guess we were in for a noisy start. Whilst waiting to be blown away with the noise we completed our warm up by setting watches and talking. Then there was a quiet pop and a puff of smoke and we were off Ali leading. I had my sunglasses knocked out of my hand by the time I picked them off the floor Karen and Jacquie were in the distance up onto the prom turn left and after 1/2 mile turn round a cone and head back the way we came managing to say hello to our friends who were faster than us. Familiar faces spotted, were spectators Dave Robson and Mel Hudson. Dave hiding behind one side of the camera so I thought I would hide a behind a couple of runners on the other side of the camera. and not be shot at. Onwards towards the Ghost Ships if they are still to be seen I have Jacquie in my sights and pass her, approaching 2 mile. Thoughts pass through your a mind were is the traffic cone to turn round as nobody is in sight coming the opposite way, then this ghostly figure appears maybe from those ships and it looked as though he was riding the crest of the waves like a speed boat. WHY ! because he is being chased by a mad bunch of pirates. STOP. They are not pirates because there are some friendly faces to be seen and greetings are exchanged. Turning point reached and were instructed by this 6ft 12" pirate to go round him without any argument and head for the Castle. Spied by camera Dave and this time I was shot. Heading into civilisation caught up with Karen and dragged her to the finish taking a few prisoners on the way. Across the line to a welcome bottle of white rum and a new shirt before retiring to McDs for cooked breakfast, cake, ice cream and coffee, before leaving the monkey hangers to there own devices. Anybody turning up next year to create waves, as this year the course was flat calm. The best thing about offering someone a lift to a race is that when the alarm goes off at 5AM, you can't just think, sod it, I'm going back to sleep. You've just got to haul yourself out of bed and try and get excited about whatever it was you entered a week ago that seemed like a good idea at the time. A few cups of coffee later with sun shining with Narnian promise I picked up Till and we were soon trundling down the M1. While chatting about Garmins, GPS, Satnavs and navigation in general, we sailed past the Scotch Corner turn-off, deftly picking up the Catterick one instead. My Satnav was nonplussed at the road closure that greeted us a few miles later, but that issue resolved, it was plain sailing to Leyburn. It was during another GPS chat that, ironically, my Satnav chirpily announced "You have arrived at your destination, your destination is on the right.". Apparently we'd arrived. We looked around for other runners, of which there were none. No boots, no lekis, no rucksacks. Just a deserted town square. We consulted our maps, paper and digital, and discovered that registration was somewhere back that way. We retraced our route and soon found the large bright signs for the Rotary Club of Wensleydale. Registration took no time at all and Till went over to examine the maps and check his route. I was pretty sure the run advertised itself as well marshalled and signed, and the rotary gadgie said there were little red arrows to follow, which was good enough for me. He also said there'd be a hot dog stand at the half-way checkpoint - oh yes, ha ha, very droll. With plenty of time to spare we nipped back to the car for coffee and kit chat. I was beginning to regret not bringing shorts as it was beginning to look like being a scorcher, at least, compared to the recent weather. As we headed for the Start I handed Till my spare car key just in case, you know, he happened to get back before me. The mass start of walkers and runners clattered out of town in a jumble of Lekis, bumbags and rucksacks. The sun and some daffodils were out and it was looking like being a good day. Before long runners thinned out and I jogged on in a world of my own following the frequent little red arrows indicating the route of the Wensleydale Wander. At the half-way checkpoint there it was, sure enough, the hot dog stand. With onions, and nippy sauce too. Lovely. I scoffed it down and jogged on, hoping I wouldn't be seeing my hot dog again before the finish. Having comfortably finished the far tougher Cleveland Survival a few weeks earlier I was, frankly, expecting today to be a bit of a breeze. But as the final miles wound down I really began to feel the distance. The little red arrows just kept on appearing, without end. Finally, after a robust little climb back into Leyburn it was a short jog back to the finish at registration. Not before I had to ask a couple of walkers if I was going the correct way, as I realised I hadn't actually bothered to check where the finish was and the red arrows had, finally, stopped. Walking into the dining hall I discovered Till had showered, changed, eaten, and probably regretted not bringing that book to read that I'd suggested. Till finished pretty much dead on 3 hours, third overall on the long course, just beating me by a slim margin of 1hr25m. I had some food and drank lots of tea, and for some time sat in dazed mystification at how this 'easy', flattish run had managed to be so much tougher than the same distance Cleveland Survival. I'll never understand racing. A few days before the race, the organisers ominously announced a change to the route due to "several feet of snow" on the course. However, clear blue skies and sunshine greeted us on the day, so Dougie and I decided to forego the waterproofs - except for the socks, which turned out to be rather handy! After the start from Leyburn's market place, nobody seemed too eager to take on the pace, so I found myself in the odd position of leading the field - a nice experience, but in the knowledge that there were some much fitter looking runners behind me, I wondered if I really knew what I was in for. After about a mile or two, the more experienced runners eventually had enough of seeing myself fumble with the various gates and stiles, and I was relieved when someone else took the lead. We crossed the first large field in a group of five, and I was content to slot in near the back of the pack. The route was now mostly on small trails mixed with the occasional paved road or muddy field. I passed the other runners again, except for two who were now running away at the front. Sensibly, I decided not to give chase, but tried to keep them in sight for as long as possible. Once the path became less clear, they disappeared, and I was on my own - the objective now changed to not missing any of the small red arrows that marked the way. The ascent to the one big hill was relatively straightforward, with a stop for drinks about half way up. While the roads near the top were indeed covered in snow, there was usually a narrow path at the side were the running was easy. The checkpoint at the top was followed by a long road section, which I decided would be my best chance of catching the leaders. I never caught a glimpse of them again, but several fast miles probably ensured that I, too, would not get caught until the finish. Once we left the road again, navigation became a lot trickier - there was often an arrow marking the entrance to a field, but I found myself running around fields a few of times, looking for the next red arrow to mark the exit. At this point, I was glad to have brought my map, although local knowledge would have helped as well. The final seven miles were mostly off-road, and the combination of tired legs, soft ground, and a few more missed red arrows slowed me down quite considerably. Still, I could see Leyburn from a distance, and in the knowledge that my third place was not in jeopardy, I took it easy on the final ascent, finishing just outside of three hours. At the finish, we were treated to a hot meal, apple cake, tea and coffee, and even a hot shower - all for the price of £10, and with the total proceeds going to charity. For anyone planning to do this, be sure to save some energy for the latter stages, especially if the ground is muddy. The route marking is more than adequate for walkers, but runners have to keep alert - read the description, and don't forget your map. You'll probably still get lost once or twice, but as long as you see it as part of the fun, you'll have a great day!